We want you to be happy with your purchase. Try the product for 60 days – if you don’t love it you can return it for a full refund. 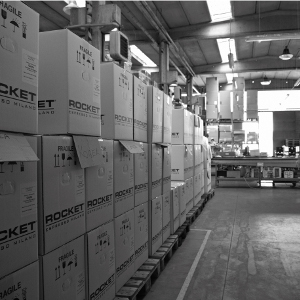 NOTE: To prevent shipping damage, all Rocket R58s are now shipping on a pallet via common carrier. This is the most up to date 2017 updated version with adjustable feet. Some websites have it listed as v3, but it's actually v2 with adjustable feet added. 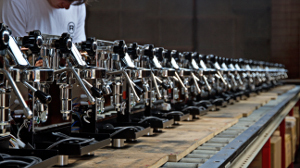 The R58 is another outstanding espresso machine designed by Rocket Espresso Milano. Some of its key features include a dual boiler, a commercial grade rotary water pump, PID temperature control, and the choice between using a water reservoir or a direct water connection. The Rocket R58 is made with high quality AISI 304 stainless steel, providing long lasting beauty and durability. 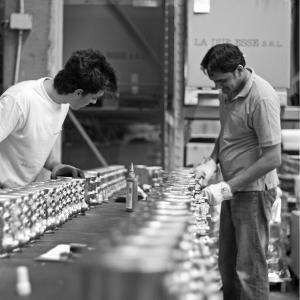 Even the cup frame surround is made with stainless steel. 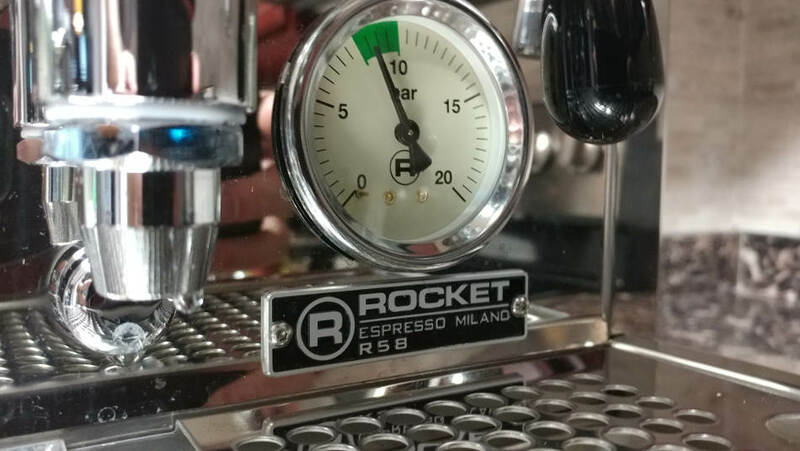 Weighing in at 9 lbs, the Rocket R58 has one of the highest quality, commercial grade group heads available, providing outstanding heat stability. 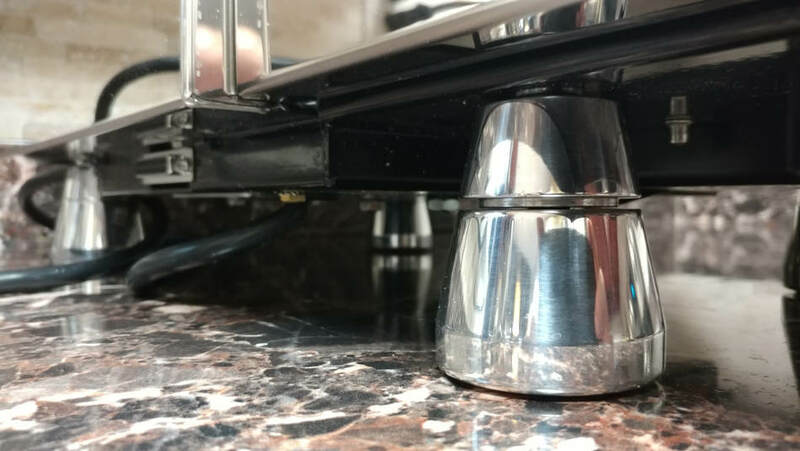 Heat stability is a crucial part of making good espresso as temperature fluctuations can greatly alter the flavor and consistency of brewed espresso. Obtain smooth coffee extraction with great aroma, body, and “crema” through a dual pre-infusion system. The system features a mechanical pre-infusion system with a progressively working piston and static pre-infusion chamber. 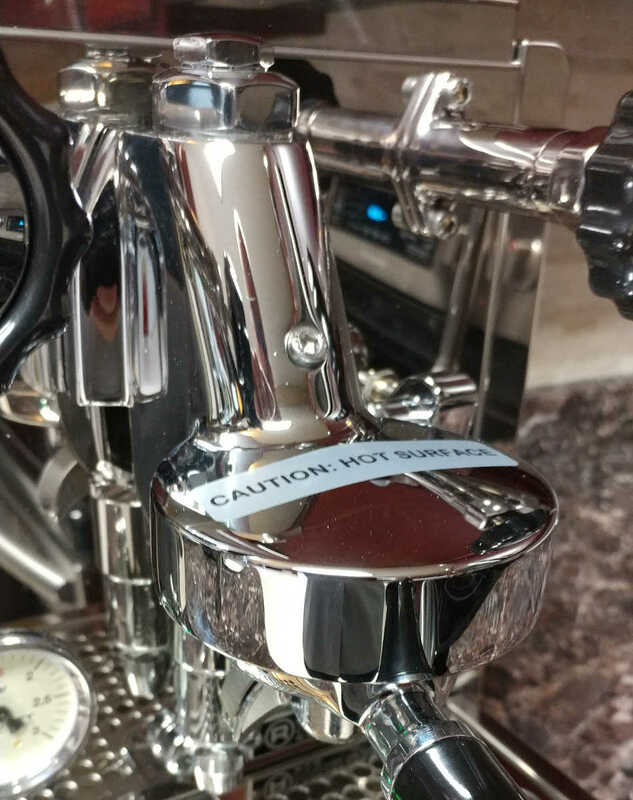 Anyone who has done their research in the espresso machine market will know this is a unique feature that isn’t available on many competing espresso machines. 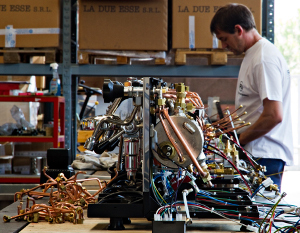 The boiler for coffee brewing has a 0.58 liter capacity, while the second boiler has a 1.7 liter capacity and is used for steaming / hot water dispensing. 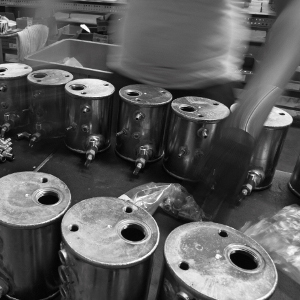 Both boilers are made with high quality copper and come with brass end plates, providing great heat stability. For additional temperature stability, the boilers have external insulation. 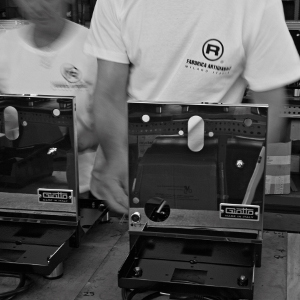 Heating power is optimized to result in quick heat up times. The brewing boiler uses 1400 watts and the steaming / hot water dispenser boiler uses 1400 watts. When the boilers are used simultaneously, the combined power consumption of both boilers combined is 1550 watts. 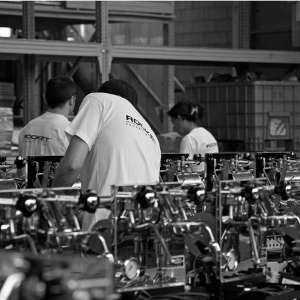 For optimal performance, the Rocket R58 features a commercial grade, high quality, rotary water pump. It even has external pressure adjustment for enhanced pressure control. The sound level of the Rocket R58 rotary vane pump during extraction is about 67 decibels if measured right next to the machine. If measured 3 feet away, the sound level drops to about 59 decibels. Monitor the pressure in each boiler with high quality, dual pressure gauges – one gauge for each boiler. 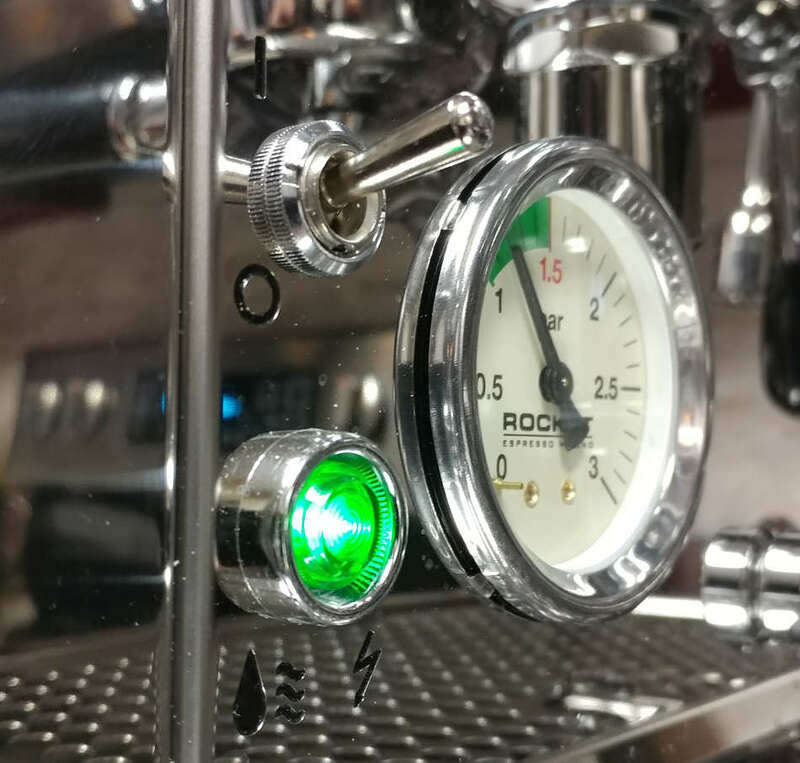 A nice feature on the Rocket R58 is the cool touch, anti-burn, stainless steel steam wand. Only the nozzle gets hot during operation, making operation, safe and worry free. As an added benefit, milk doesn’t bake to the wand during operation, making cleaning a breeze. The steam nozzle is designed for easy milk frothing and can produce some of the finest microfoam possible. A microprocessor is used to automatically control the water level in both boilers. An additional low water indication system monitors the water reservoir to ensure that water level doesn’t get too low. 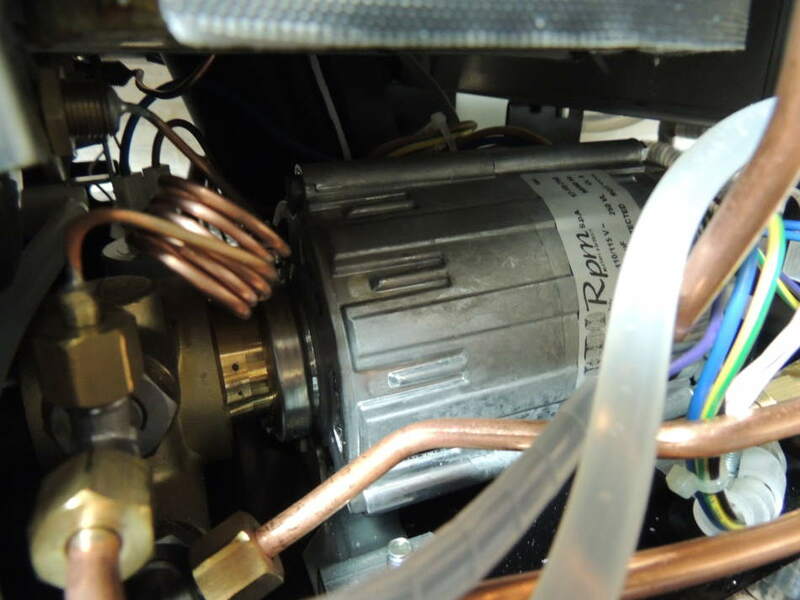 Operating the machine without water can cause costly damage to the heating element. The low water indication system helps prevent this from happening. The power button will flash when the water is low. The Rocket R58 has two water options – a reservoir or a direct water connection. The water reservoir has a capacity of 2.5 liters. The espresso machine also has a full drip tray drainage system. Use the module to change brew boiler temperature, steam boiler temperature, temperature units, language of the controller, and switch between direct connect or water reservoir. 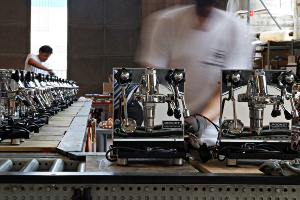 Rocket Espresso Milano was founded by Andrew Meo and Daniele Berenbruch with the vision of producing only the finest, handmade, legendary machines. They acheived their goal by purchasing the rights to designs from the Italian company ECM - a company known for superb home espresso machines. 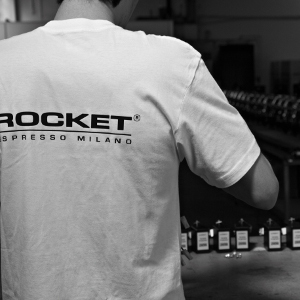 Rocket espresso machines are now known as some of the most beautiful, well designed machines in the world. The espresso shots are wonderful. I love my machine. Machine was shipped extremely fast and double boxed with added protection. The detachable pid remote is actually one of the features I liked as I prefer a traditional look with no visible electronic. I think Rocket did a great job. The R58 works exactly as described...actually better. Its quiet, and its PID interface is very easy to use. Not much to screw up here. The preinfusion works beautifully as well, despite what some say. Double boiler is the way to go! This is a beautiful machine. It is a fully capable espresso maker. This is the most fun a person can have making a cappuccino. 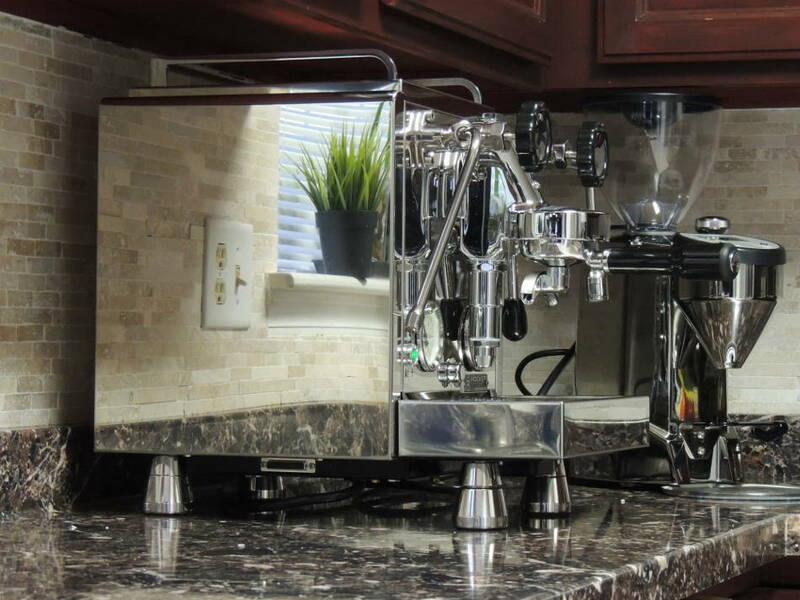 This is by far the foremost espresso machine for home use, ever fabricated; beautiful, well engineered and easy to utilize. Excellent repeatable shots time after time right after each other. Loads of steam. I love my Rocket r58. I have been using it for past 2 months every day and it's an incredible espresso shots pulling powerhouse. It's beatifully made. Definitevely a centerpice of our kitchen. But I have to send a shout out to Joe and his incredible servise as well. Of course I foud his store over the weekend. I wrote him an email about the price and he was really quick to respond. We exchanged a few emails and he was as quick every time, on Saturday night / Sunday morning. I got an incredible deal on this machine I couldn't get anywhere else. I have Amazon Prime. So I'm spoiled by Amazon shipping. But Espresso Outlet is as good. Gigantic box was at my doorstep incredibly quick. Which is even more impresive given that the box was so big that I had to move some furniture to be able to get it inside my appartment. 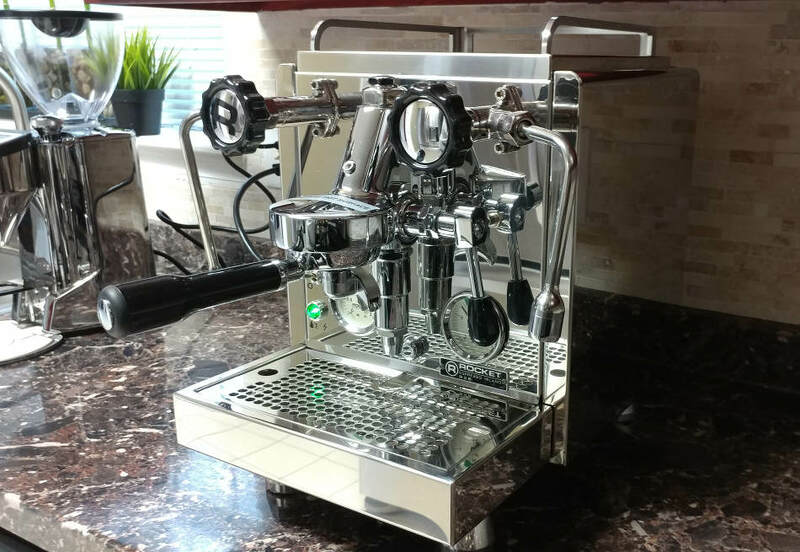 I was looking to upgrade from my Ranillio Silvia and Rocky Espresso machine setup; the Ranillio has provided a ton of love and good use over a 10-year course and in fact it still works like a charm BUT I am a foodie, wine lover, enjoy my espresso and family entertainment so it was the right time to set out on this new journey of stepping it up a notch. The same process I do whenever I upgrade any electronic and or appliance in my home I do the research; if your spending 3k plus you better make sure you do the homework and work with a solid reputable retailer especially when your dealing with specialty manufactures that you are not going to find in the typical retail stores. What are our resources? You tube, what I call the top 4 online espresso retailers and or distributers? and Blogs…. What I tend to see are blogs are bias and or not a real reflection of a product more of an opinion or that persons experience but you don’t know their level of expertise so it’s a hard gauge, and the retailers and or distributers are bias towards specific machines; but I will say this give make sure you know what you want in term of features, usage, price point than you can pretty much narrow it down quickly and this is what I did. What are the top online resources? 1st in Coffee, Wholelatte, Seattle Coffee Gear and Chris’s Coffee 1st in coffee is where I purchased my first machine my Ranillio very positive experience and the owner has good overall general knowledge of his products, Wholelatte have not dealt with outside watching You Tube and videos are helpful one thing I saw here was price point was a bit higher (again never called to negotiate), Seattle “who does not like Gail’s videos and passion they are great; must be a great local place, and Chris’s I have never seen such consistent reviews and they are responsive BUT then I stumbled across Espresso Outlet now seeing the name I am thinking “Outlet” for me that means cheap re-branding machines with kids running the store front but I sent an inquiry anyway, why not I am in the market for a machine lets exhaust all options. You asking what setup did I get right? First keep in mind as I stated earlier walk in knowing what your budget is, what functions you want, usage and tolerance for educating yourself on making these great coffee based drinks because its not like a car or TV your taking out of the box and driving or watching it will take some time to dial it in no matter what machine you go with it. I am a proud owner of the……. Rocket v58 and what a machine from looks, feel, quality of the construction and lets not forget the coffee is amazing BUT it’s not the machine itself that makes the coffee amazing its 3 other factors and 2 of the 3 are obvious the beans and water but the 3rd not so much it’s the GRINDER I thought I can get away with my Rocky grinder and I could have but Joe explained to me the difference of temp with the grind, the BURRs etc… to much science for me but he held hard on get a grinder so I did MAZZER doser and its amazing… He allowed me to try the grinder side by side and if not happy send it back, well he was spot on the grinder made a BIG difference needless to say its on my countertop now. YES, you will spend 30% of what you paid for the machine for a quality grinder and read the reviews in fact they all say you may as well invest in a high end grinder and a bit less of a machine – the grinder is that important. 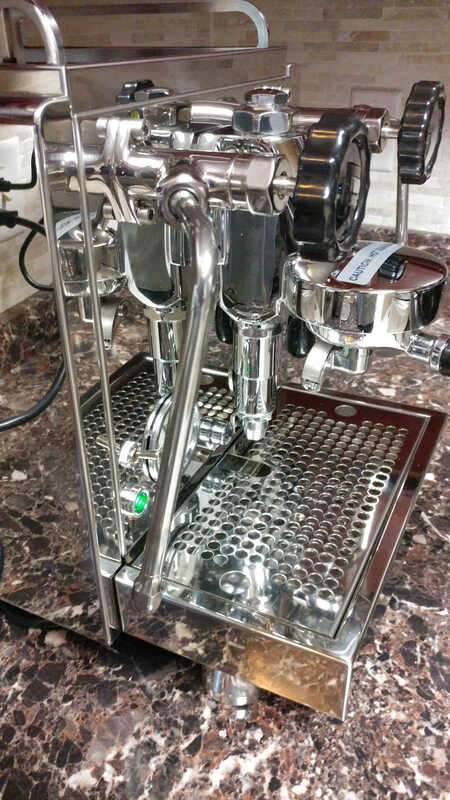 In closing if your spending good money on an espresso machine go all the way in the end its worth it and it’s a lifetime gift to you, the gamily and guests plus you can pass it down the family tree. Boiler and group pressure gauges. Low water sensor. E61 commercial group. Finely crafted 304 stainless steel case. Dual pre-infusion system. 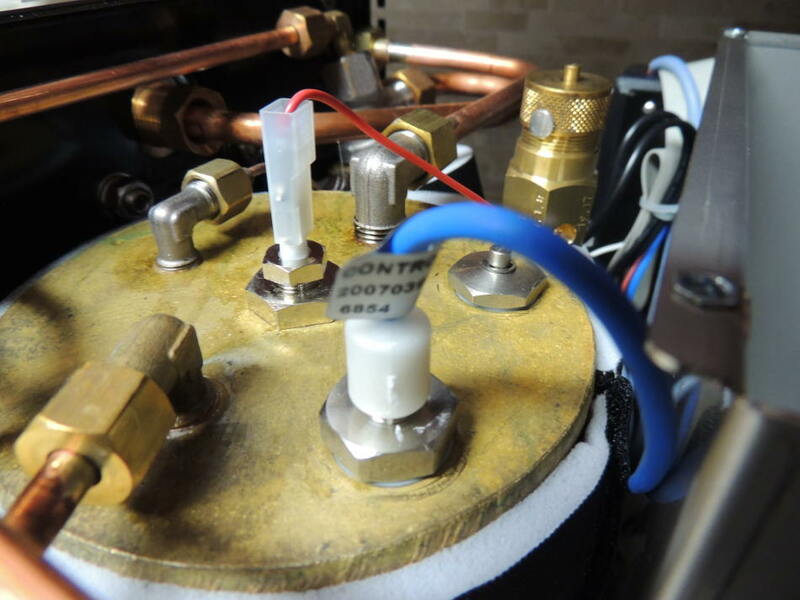 Non-compression hot water and steam valves. Two complete 58 mm portafilters (one single and one double). Free metal tamper. Stainless steel backflush disk. Drain Kit. Informative DVD that explains how to make great espresso. User manual.